When one thinks of luxury, sumptuous hotels are among the things that come to mind. From the grand hotels in bustling metropolises like London, New York, and Tokyo, to the quainter – yet no less charming hotels in more remote locations, grandeur has become synonymous with hotels. 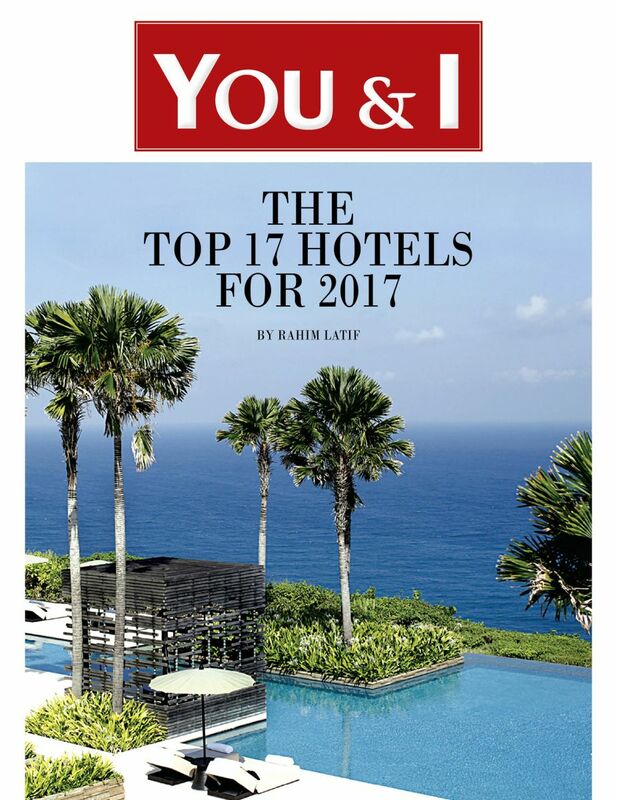 And with rising disposable incomes and people’s desires to become more well-travelled and exposed to the finer things, the demand for luxury hotels is only expanding. We take you through 17 of our top choices for 2017. Our list is carefully curated, based on a number of key factors. Generally, when people stay in an extravagant five-star hotel, they tend to look for both small and big details. ‘The Visual’ is one of the most important factors, as this creates the aura and experience the hotel is trying to convey. And it means that both the interiors and exteriors must be up to the mark as a basic concept. For example, many guests love to stay in palaces, which are known to be a visual treat. Another example is embracing the surroundings like many Maldivian resorts, which often make nature the centre of attention. ‘Utility Sophistication’ is a must for a five-star, if they want to keep that rating. Utilities such as Michelin star restaurants, push the quality of the hotel to a higher level. Infinity pools, gyms, spas, shops, etc. must be designed glamorously, and must function at their highest efficiency. An example could be a Chanel store or Nobu as a restaurant. This definitely escalates the rating of the hotel. Another basic requirement is the service offered by the hotel staff. If it is not exceptional, the hotel cannot maintain its rating. Staff services could mean a butler getting your laundry cleaned, or even a chef that makes gourmet food that perfectly fits the guest’s needs and desires. Smaller touches, such as a Mont Blanc pen and notepad, can also step up the hotel’s cachet. Small details such as touchscreen switches help make the guestrooms more efficient and easier to use. These factors can be used to help decide which hotels to stay in. 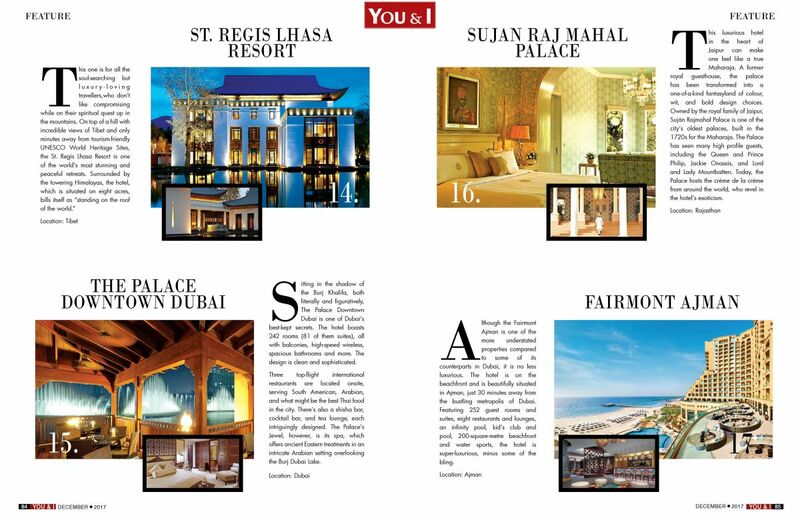 We chose the best hotels by identifying traits common to the most luxurious properties available. 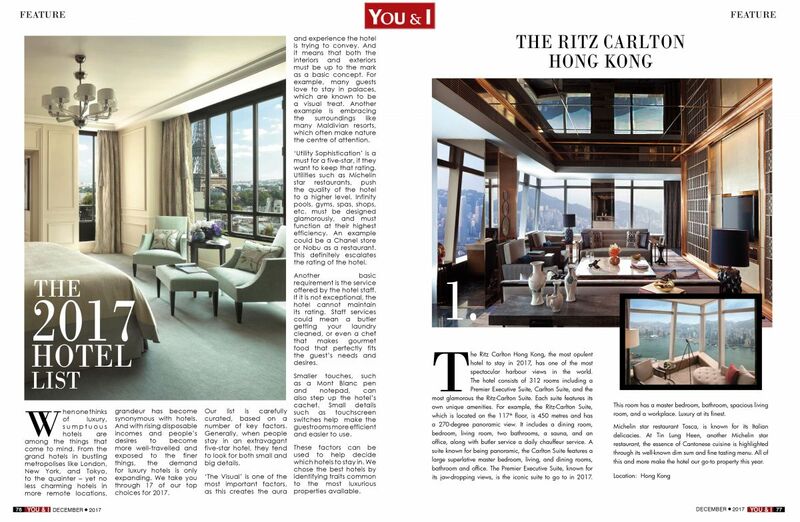 The Ritz Carlton Hong Kong, the most opulent hotel to stay in 2017, has one of the most spectacular harbour views in the world. The hotel consists of 312 rooms including a Premier Executive Suite, Carlton Suite, and the most glamorous the Ritz-Carlton Suite. Each suite features its own unique amenities. For example, the Ritz-Carlton Suite, which is located on the 117th floor, is 450 metres and has a 270-degree panoramic view. It includes a dining room, bedroom, living room, two bathrooms, a sauna, and an office, along with butler service a daily chauffeur service. A suite known for being panoramic, the Carlton Suite features a large superlative master bedroom, living, and dining rooms, bathroom and office. 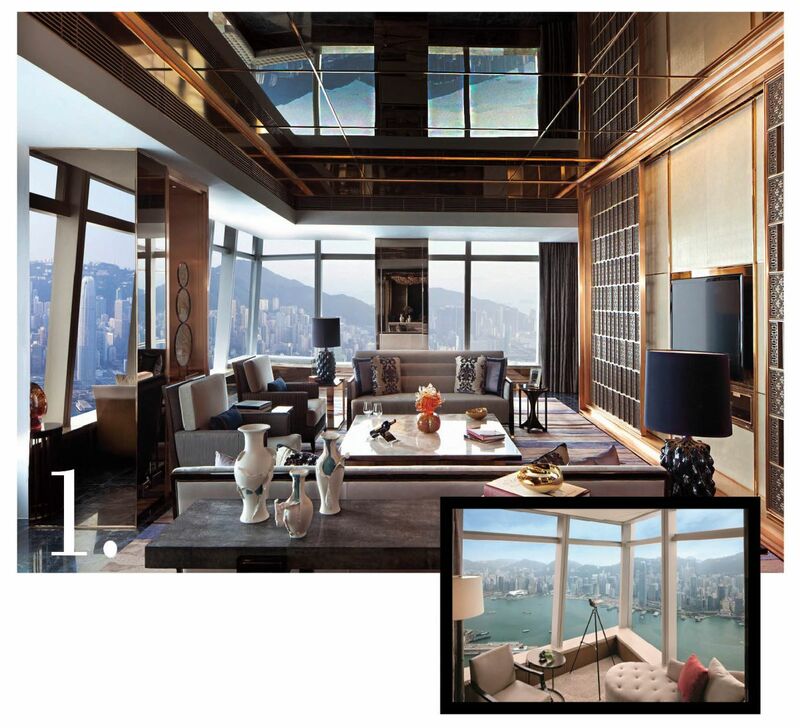 The Premier Executive Suite, known for its jaw-dropping views, is the iconic suite to go to in 2017. This room has a master bedroom, bathroom, spacious living room, and a workplace. Luxury at its finest.Michelin star restaurant Tosca, is known for its Italian delicacies. At Tin Lung Heen, another Michelin star restaurant, the essence of Cantonese cuisine is highlighted through its well-known dim sum and fine tasting menu. All of this and more make the hotel our go-to property this year. 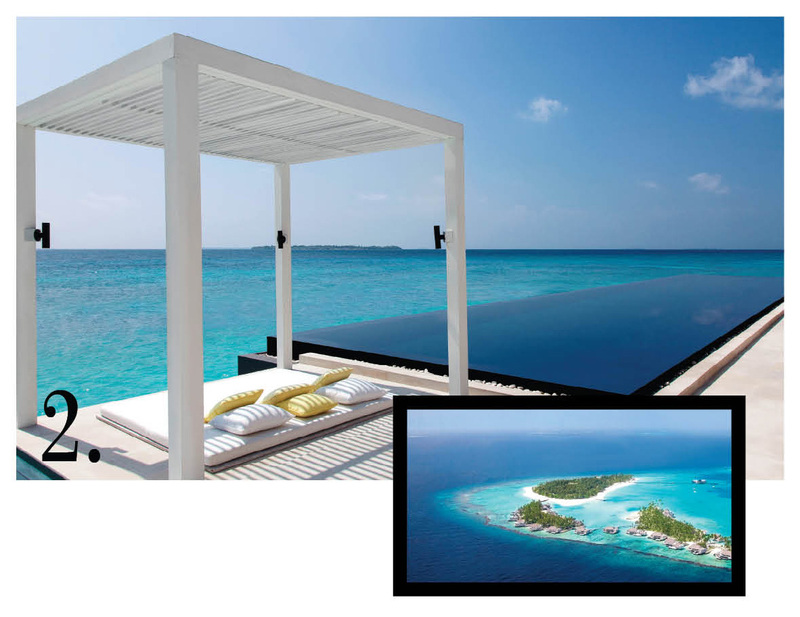 The Cheval Blanc Randheli is ideally situated in the Maldives, one of the best places on earth. 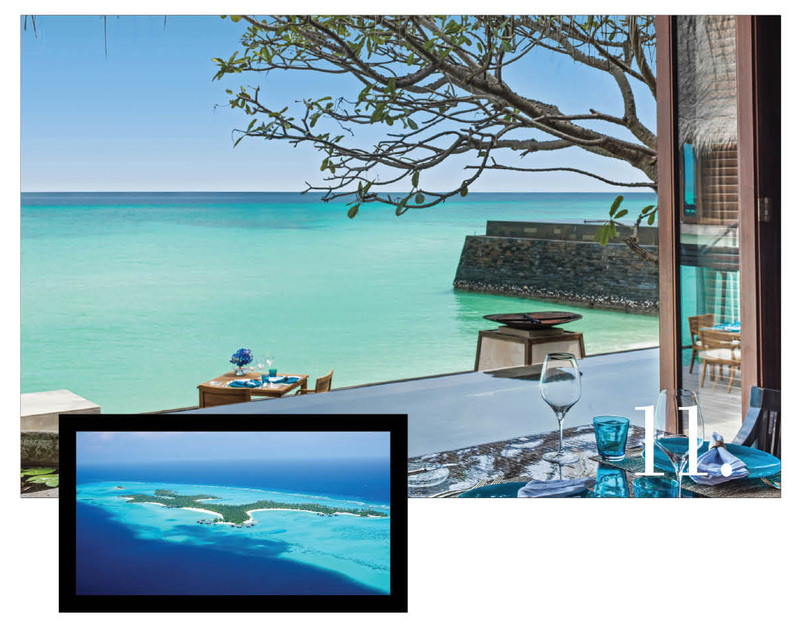 This opulent hotspot is known for its jaw-dropping beauty, spoiling you with its breathtaking views of the Indian Ocean. The lagoon, filled with coral and innumerable species of marine life, pulls you to a certain happy place, reminding you that this is nature. The hotel’s water and lagoon villas are a very high-end choice. 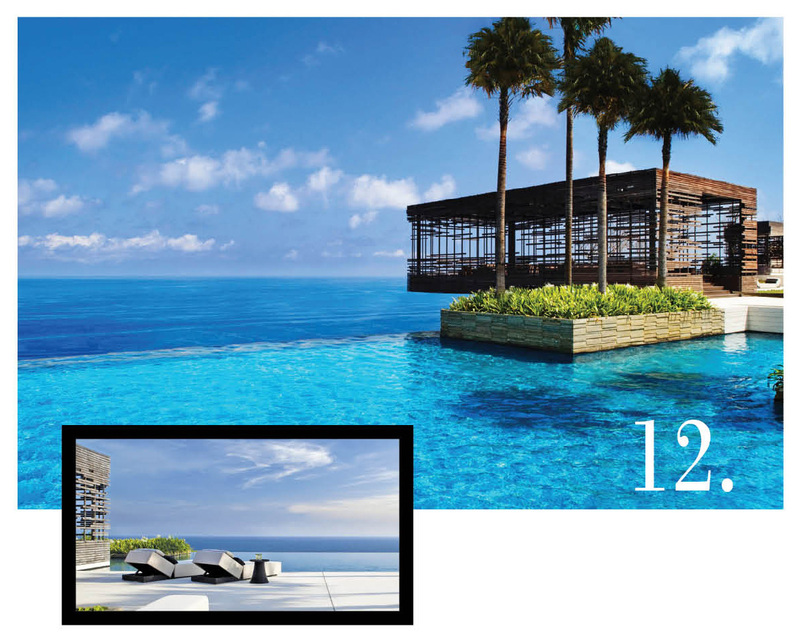 Features such as the deck, the infinity pool and the lagoon can completely relax every nerve of your body. The Deelani, a spectacular Mediterranean restaurant, is named for the breeze that flows through the Maldives. 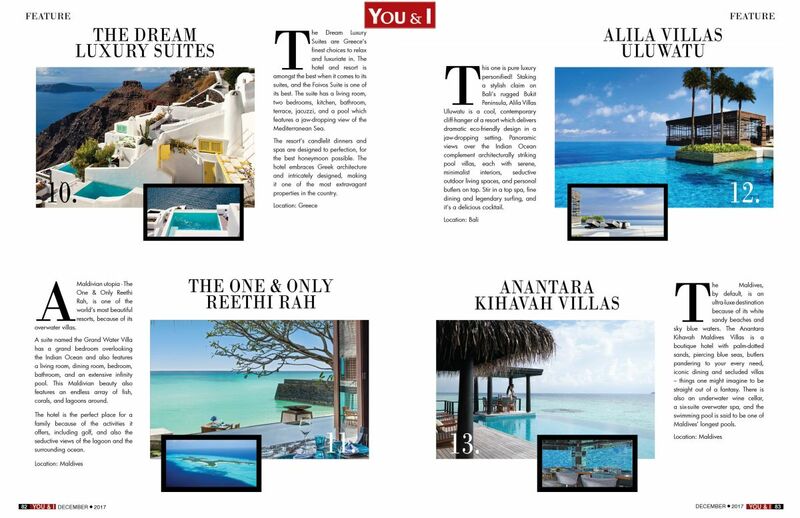 All of this makes you realise that the Maldives is very much the place to be. This is one of India’s crown jewels. Built in 1903, the Taj Mahal Palace in Mumbai is considered one of the finest hotels in India, featuring a fusion of Moorish, Oriental, and Florentine architectural styles that scream opulent. 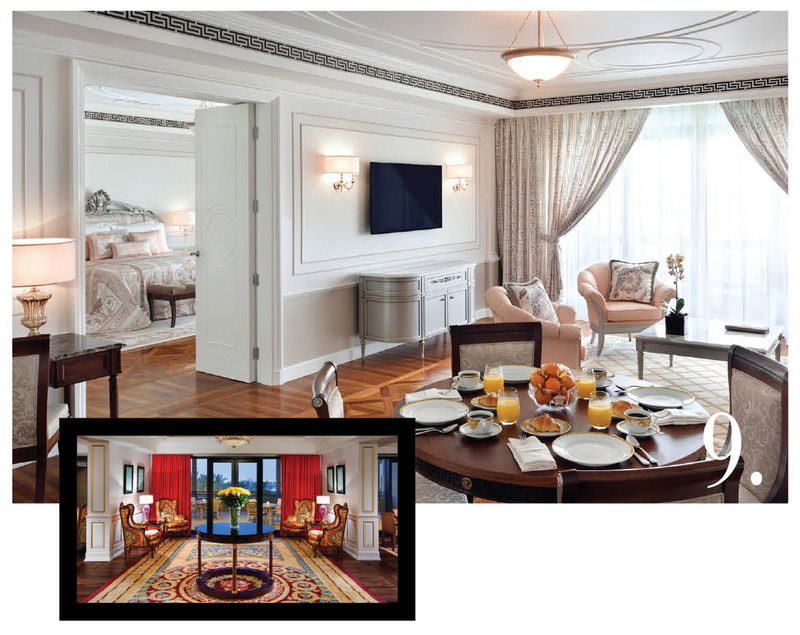 The interiors have been very tastefully done, and include alabaster ceilings, silk carpets, and onyx columns. The hotel has some remarkable history as well. Famously built by J.N. Tata to mark Mumbai’s arrival on the global business map, The Taj Mahal Palace even pre-dates the illustrious Gateway of India by 21 years. This marvellously opulent hotel has 560 rooms divided between its two wings. And when it comes to cuisine, the options available here are second to none. 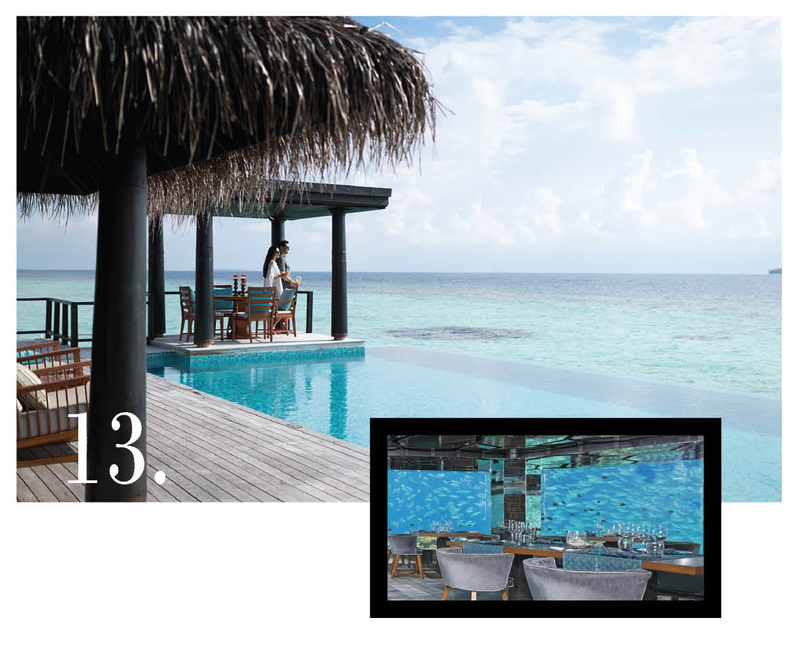 Tucked away among the atolls of the Maldives, the Per Aquum Niyama is surrounded by 3600 of heaven. The hotel has suites ranging from a beach studio to a suite named The Crescent. Top-notch restaurants, snorkelling, and yacht rides to nearby islands help make the hotel it what it is – an electrifying experience. The hotel’s most glamorous feature is The Crescent, a suite designed for the perfect family holiday. It includes one two-bedroom water villa with a pool, two one-bedroom water villas with a pool, and two deluxe water studios with a pool. Even though the hotel has some of the most beautiful suites available anywhere, the white sands of the island, the exotic array of coloured coral, and the ocean’s marine life are what make this splendid resort a true masterpiece. 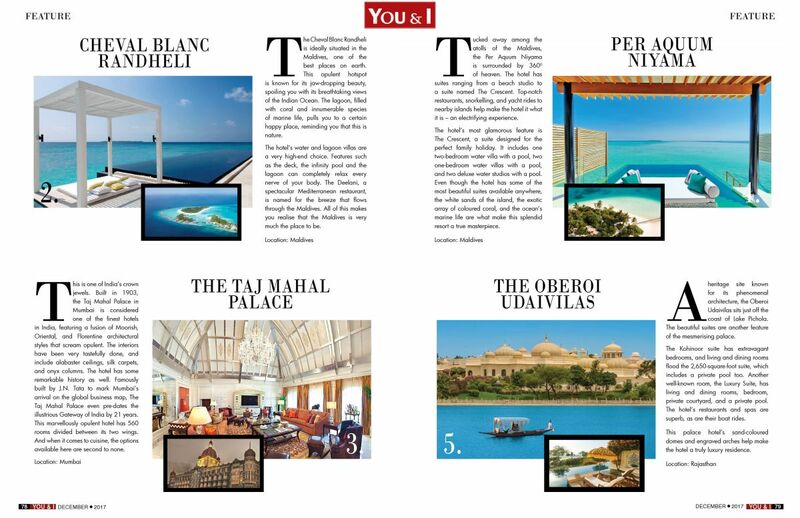 A heritage site known for its phenomenal architecture, the Oberoi Udaivilas sits just off the coast of Lake Pichola. 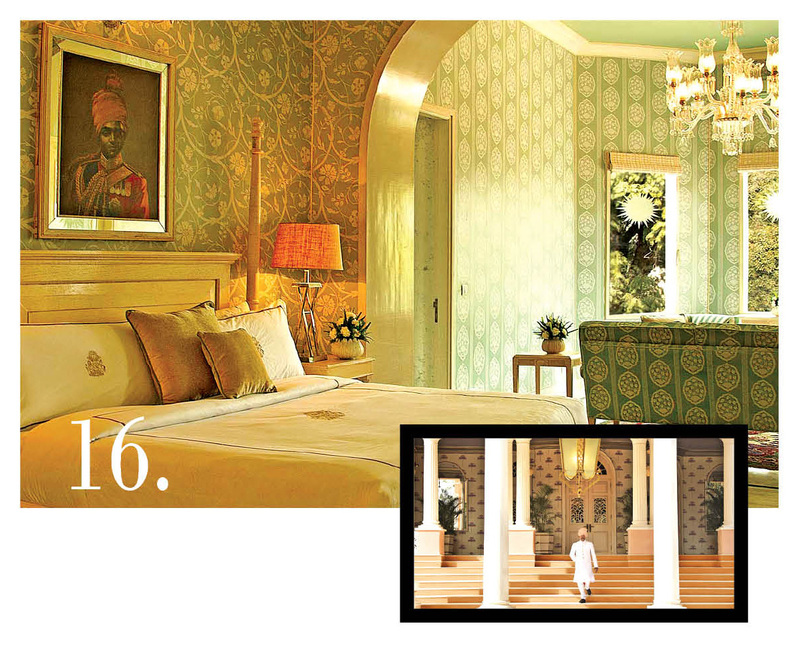 The beautiful suites are another feature of the mesmerising palace. The Kohinoor suite has extravagant bedrooms, and living and dining rooms flood the 2,650-square-foot suite, which includes a private pool too. Another well-known room, the Luxury Suite, has living and dining rooms, bedroom, private courtyard, and a private pool. The hotel’s restaurants and spas are superb, as are their boat rides. 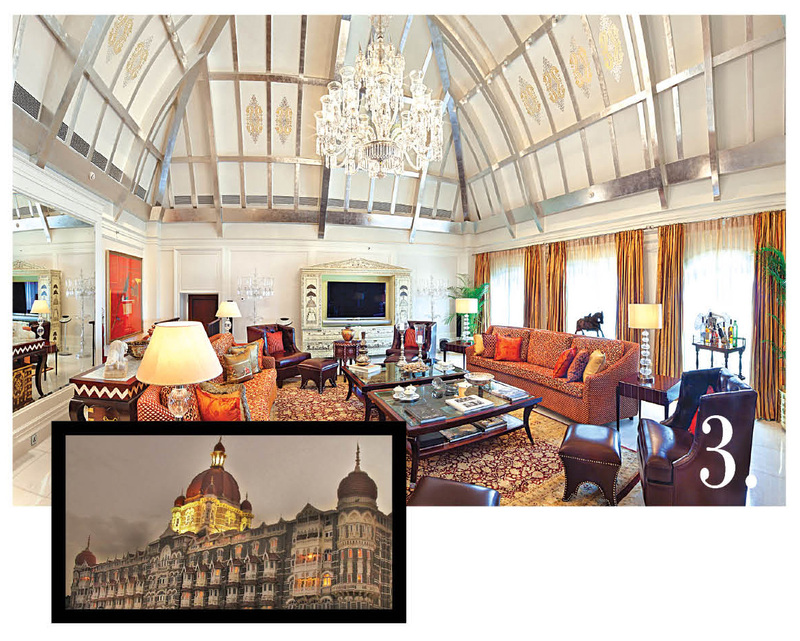 This palace hotel’s sand-coloured domes and engraved arches help make the hotel a truly luxury residence. 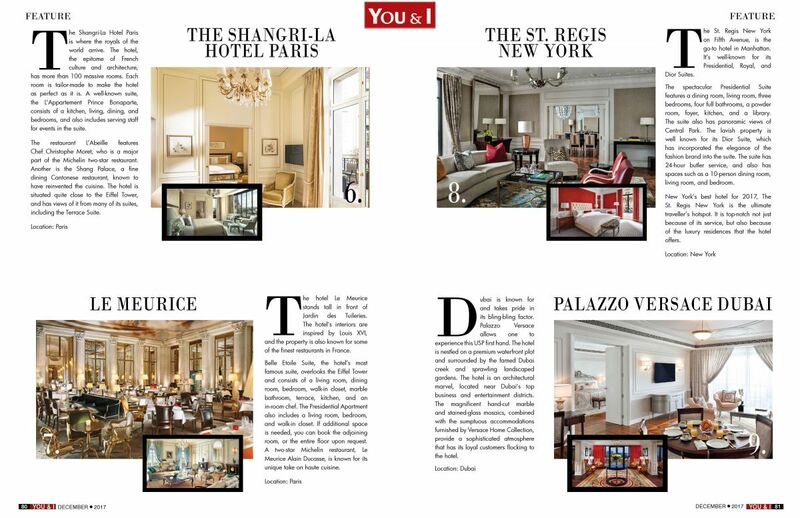 The Shangri-La Hotel Paris is where the royals of the world arrive. The hotel, the epitome of French culture and architecture, has more than 100 massive rooms. Each room is tailor-made to make the hotel as perfect as it is. A well-known suite, the L’Appartement Prince Bonaparte, consists of a kitchen, living, dining, and bedrooms, and also includes serving staff for events in the suite. The restaurant L’Abeille features Chef Christophe Moret, who is a major part of the Michelin two-star restaurant. 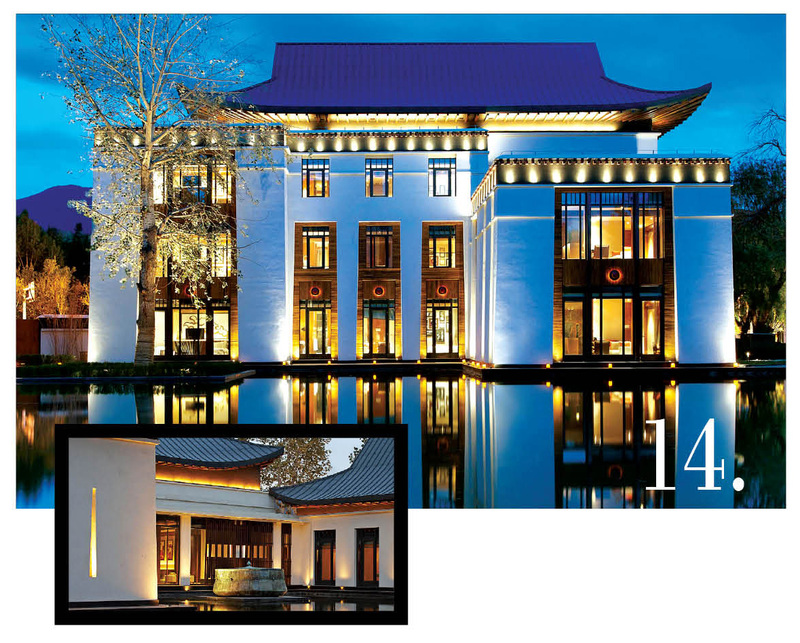 Another is the Shang Palace, a fine dining Cantonese restaurant, known to have reinvented the cuisine. The hotel is situated quite close to the Eiffel Tower, and has views of it from many of its suites, including the Terrace Suite. The hotel Le Meurice stands tall in front of Jardin des Tuileries. The hotel’s interiors are inspired by Louis XVI, and the property is also known for some of the finest restaurants in France. 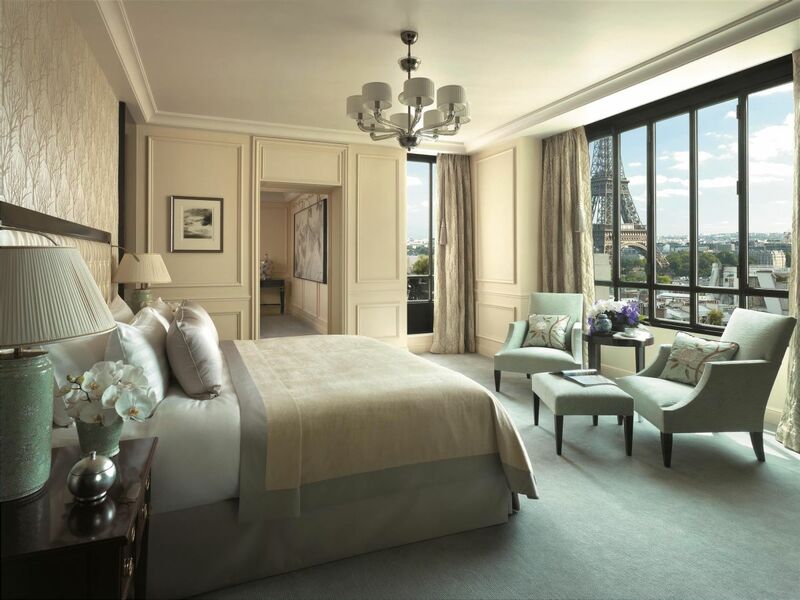 Belle Etoile Suite, the hotel’s most famous suite, overlooks the Eiffel Tower and consists of a living room, dining room, bedroom, walk-in closet, marble bathroom, terrace, kitchen, and an in-room chef. The Presidential Apartment also includes a living room, bedroom, and walk-in closet. If additional space is needed, you can book the adjoining room, or the entire floor upon request. 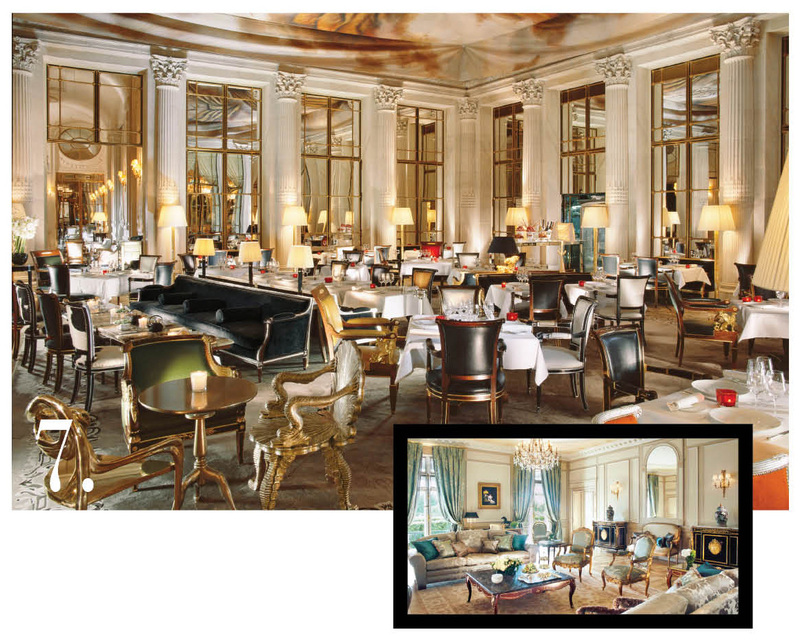 A two-star Michelin restaurant, Le Meurice Alain Ducasse, is known for its unique take on haute cuisine. 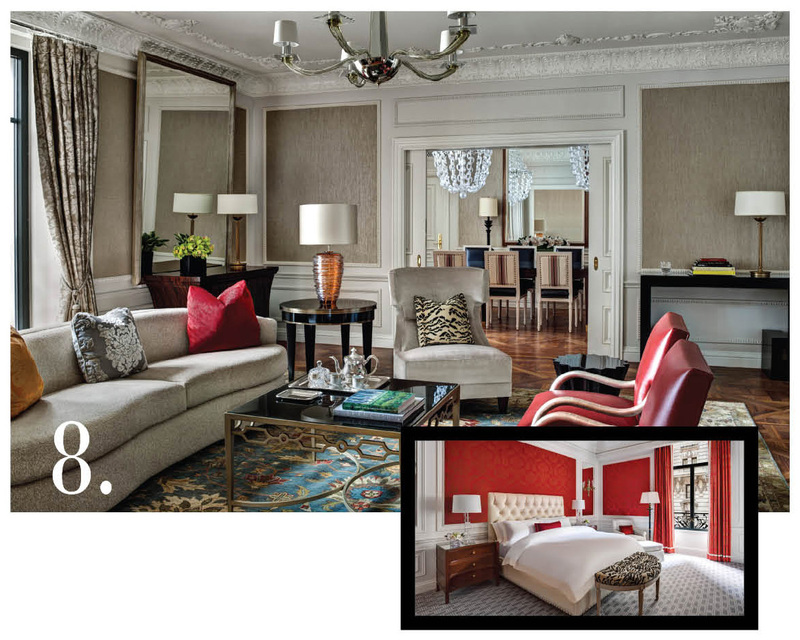 The St. Regis New York on Fifth Avenue, is the go-to hotel in Manhattan. It’s well-known for its Presidential, Royal, and Dior Suites.The spectacular Presidential Suite features a dining room, living room, three bedrooms, four full bathrooms, a powder room, foyer, kitchen, and a library. The suite also has panoramic views of Central Park. 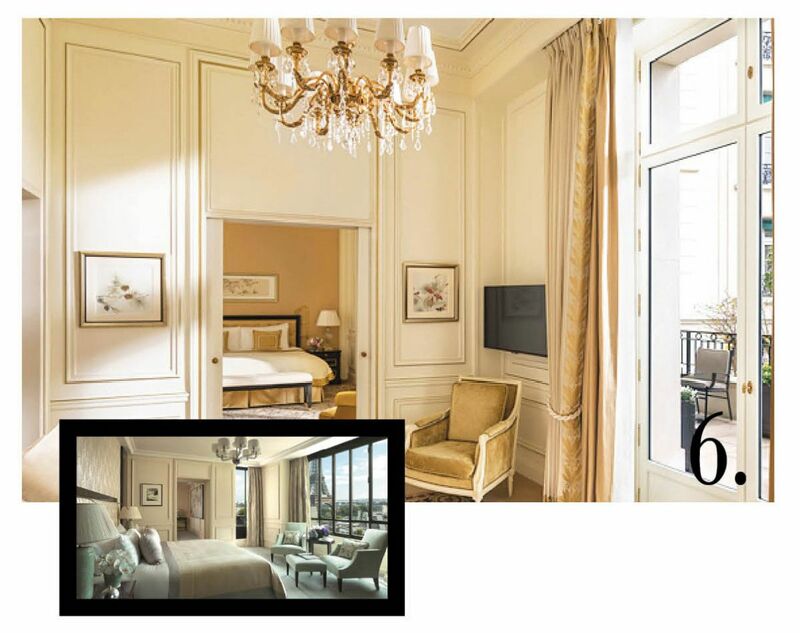 The lavish property is well known for its Dior Suite, which has incorporated the elegance of the fashion brand into the suite. The suite has 24-hour butler service, and also has spaces such as a 10-person dining room, living room, and bedroom. New York’s best hotel for 2017, The St. Regis New York is the ultimate traveller’s hotspot. It is top-notch not just because of its service, but also because of the luxury residences that the hotel offers. Dubai is known for and takes pride in its bling-bling factor. Palazzo Versace allows one to experience this USP first hand. The hotel is nestled on a premium waterfront plot and surrounded by the famed Dubai creek and sprawling landscaped gardens. The hotel is an architectural marvel, located near Dubai’s top business and entertainment districts. The magnificent hand-cut marble and stained-glass mosaics, combined with the sumptuous accommodations furnished by Versace Home Collection, provide a sophisticated atmosphere that has its loyal customers flocking to the hotel. 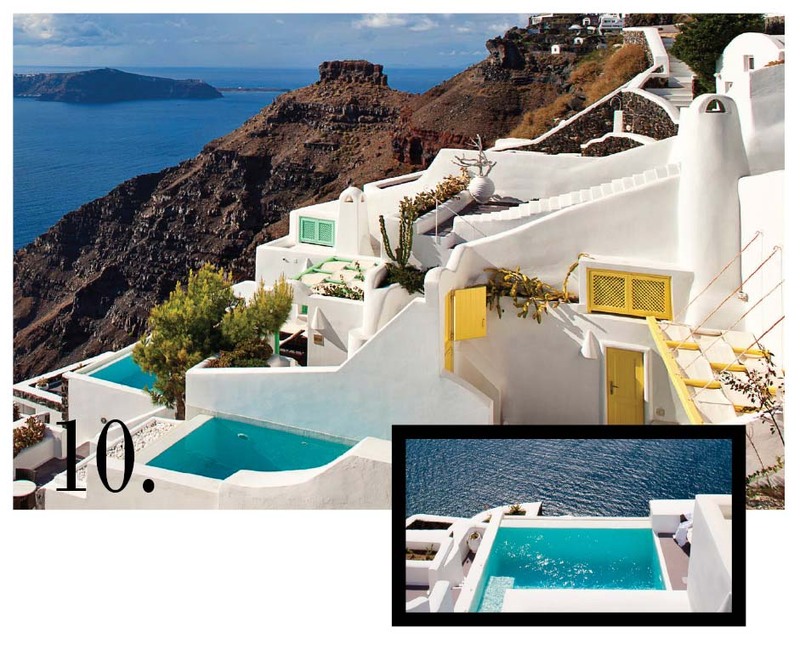 The Dream Luxury Suites are Greece’s finest choices to relax and luxuriate in. The hotel and resort is amongst the best when it comes to its suites, and the Foivos Suite is one of its best. The suite has a living room, two bedrooms, kitchen, bathroom, terrace, jacuzzi, and a pool which features a jaw-dropping view of the Mediterranean Sea. The resort’s candlelit dinners and spas are designed to perfection, for the best honeymoon possible. The hotel embraces Greek architecture and intricately designed, making it one of the most extravagant properties in the country. 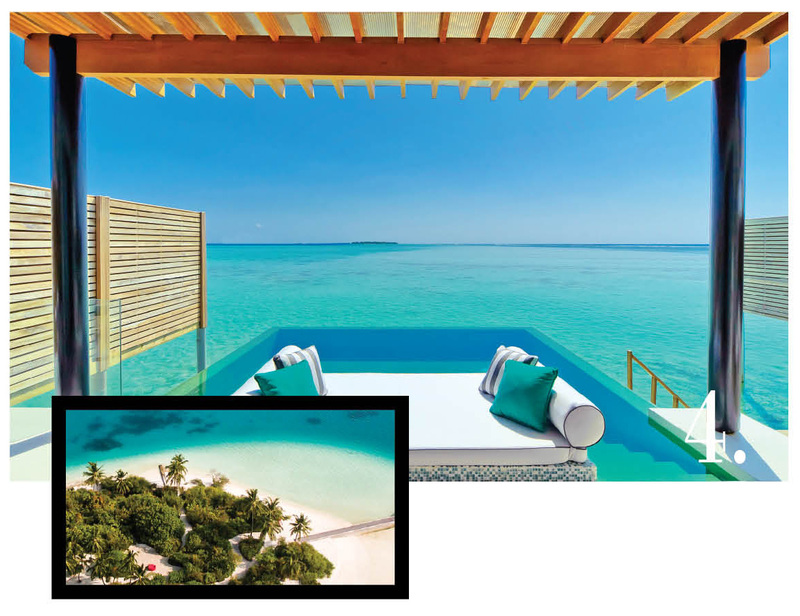 AMaldivian utopia - The One & Only Reethi Rah, is one of the world’s most beautiful resorts, because of its overwater villas. A suite named the Grand Water Villa has a grand bedroom overlooking the Indian Ocean and also features a living room, dining room, bedroom, bathroom, and an extensive infinity pool. This Maldivian beauty also features an endless array of fish, corals, and lagoons around. The hotel is the perfect place for a family because of the activities it offers, including golf, and also the seductive views of the lagoon and the surrounding ocean. This one is pure luxury personified! Staking a stylish claim on Bali’s rugged Bukit Peninsula, Alila Villas Uluwatu is a cool, contemporary cliff-hanger of a resort which delivers dramatic eco-friendly design in a jaw-dropping setting. Panoramic views over the Indian Ocean complement architecturally striking pool villas, each with serene, minimalist interiors, seductive outdoor living spaces, and personal butlers on tap. Stir in a top spa, fine dining and legendary surfing, and it's a delicious cocktail. The Maldives, by default, is an ultra-luxe destination because of its white sandy beaches and sky blue waters. The Anantara Kihavah Maldives Villas is a boutique hotel with palm-dotted sands, piercing blue seas, butlers pandering to your every need, iconic dining and secluded villas – things one might imagine to be straight out of a fantasy. There is also an underwater wine cellar, a six-suite overwater spa, and the swimming pool is said to be one of Maldives’ longest pools. Sitting in the shadow of the Burj Khalifa, both literally and figuratively, The Palace Downtown Dubai is one of Dubai’s best-kept secrets. The hotel boasts 242 rooms (81 of them suites), all with balconies, high-speed wireless, spacious bathrooms and more. The design is clean and sophisticated. Three top-flight international restaurants are located onsite, serving South American, Arabian, and what might be the best Thai food in the city. 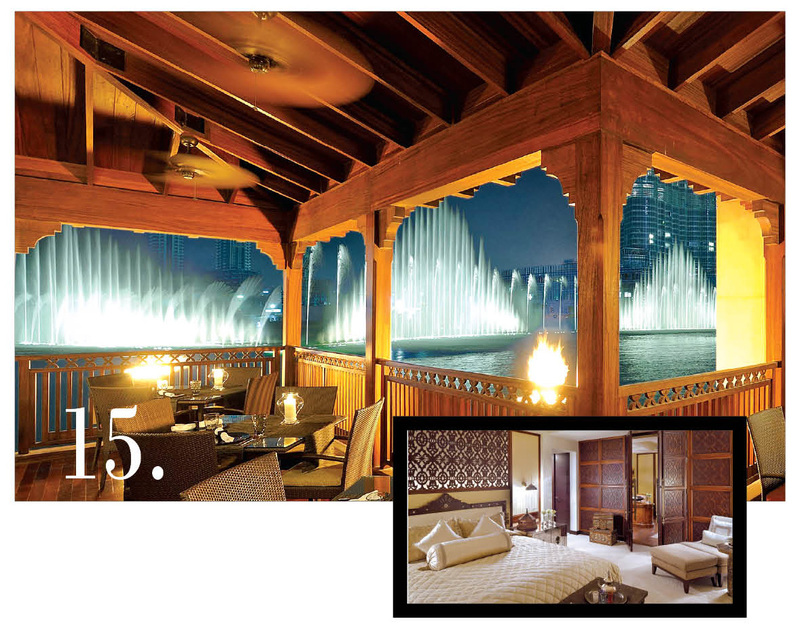 There’s also a shisha bar, cocktail bar, and tea lounge, each intriguingly designed. The Palace’s Jewel, however, is its spa, which offers ancient Eastern treatments in an intricate Arabian setting overlooking the Burj Dubai Lake. 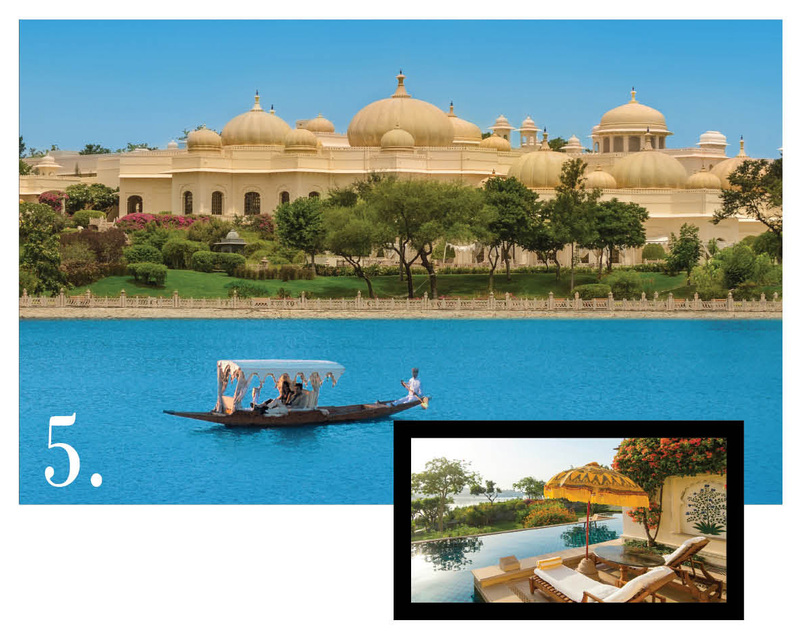 This luxurious hotel in the heart of Jaipur can make one feel like a true Maharaja. A former royal guesthouse, the palace has been transformed into a one-of-a-kind fantasyland of colour, wit, and bold design choices. Owned by the royal family of Jaipur, Suján Rajmahal Palace is one of the city’s oldest palaces, built in the 1720s for the Maharaja. The Palace has seen many high profile guests, including the Queen and Prince Philip, Jackie Onassis, and Lord and Lady Mountbatten. Today, the Palace hosts the crème de la crème from around the world, who revel in the hotel’s exoticism. 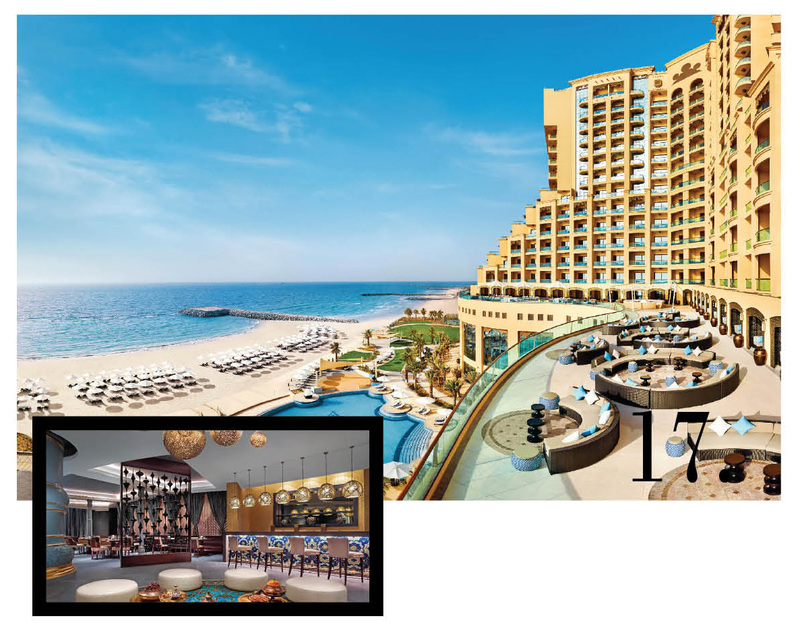 Although the Fairmont Ajman is one of the more understated properties compared to some of its counterparts in Dubai, it is no less luxurious. The hotel is on the beachfront and is beautifully situated in Ajman, just 30 minutes away from the bustling metropolis of Dubai. Featuring 252 guest rooms and suites, eight restaurants and lounges, an infinity pool, kid’s club and pool, 200-square-metre beachfront and water sports, the hotel is super-luxurious, minus some of the bling.